This recipe is better suited to the fresh berries of the summer, but if you are craving a little bit of sunshine, this might do the trick! 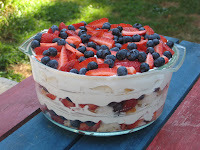 Trifles are so easy! Layer ingredients and serve with a large spoon. Delicious! Tear the angel food cake into 1 inch pieces. Layer pieces on the bottom of the trifle bowl. Sprinkle with assorted berries. Spread cool whip loosely over the berries. Repeat with angel food cake pieces, berries, and cool whip two more times. Finish with remaining berries. Chill.